The second volume of never-before-published Sherlock Holmes stories collects the contributions of great mystery writers to the genre, including Anne Perry, Shayrn McCrumb, Bill Crider, Colin Bruce, Carolyn Wheat, Jon L. Breen, and others, who offer their own interpretations of exploits of the master sleuth. Reprint. Eccentric, coldly rational, brilliant, doughty, exacting, lazy-in full bohemian color the world's most famous literary detective and his loyal companion Dr. John Watson investigate a series of previously unrecorded cases in this second collection of totally original and confounding tales. 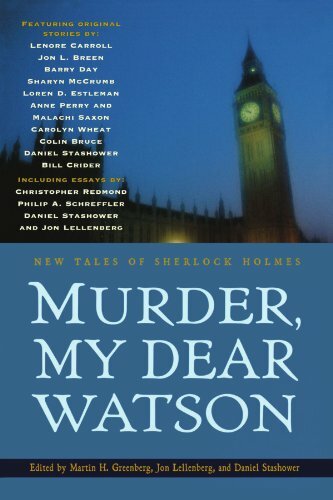 As in the popular debut volume, Murder in Baker Street, Anne Perry and ten more popular mystery writers-including Sharyn McCrumb, Carolyn Wheat, Malachi Saxon, Jon L. Breen, Bill Crider, Colin Bruce, Lenore Carroll, Barry Day, Daniel Stashower, and Loren D. Estleman- celebrate the mind and methods of Sherlock Holmes in this paperback version. In addition, Christopher Redmond illuminates the vast possibilities that new technology offers in "Sherlock Holmes on the Internet," while in "A Sherlockian Library" editors Lellenberg and Stashower provide a new list of fifty essential titles on Arthur Conan Doyle and the Holmes canon. Finally, an essay by mystery novelist Philip A. Shreffler explores one of English literature's most famous friendships in "Holmes and Watson, the Head and the Heart." This is truly a treasury of never-before-published Sherlockian tales that should not be missed. About: A collection of new stories featuring the famous detective by such writers as Anne Perry, Loren D.
About: The second volume of never-before-published Sherlock Holmes stories collects the contributions of great mystery writers to the genre, including Anne Perry, Shayrn McCrumb, Bill Crider, Colin Bruce, Carolyn Wheat, Jon L.